The answer to the question ‘What makes a good motherboard?’ can generate an alarming number of responses. When a manufacturer starts with a new chipset, the idealized view is that they partition the market off into segments – system integrators, HTPC, gaming, enthusiast, overclocker, legacy et al, and then try and get a fixed number of SKUs to target each one but encompass several others. This is not always true – design can be driven by sales of particular regions where certain features go down well, for example in the Chinese Internet Café market only one HD video output is needed. Today we look at the ASRock FM2A85X Extreme6, the high-end ASRock solution to Trinity. ASRock have released eight SKUs for FM2 – three with A85X (Extreme6, Extreme4 and Extreme4-M), four with A75 (Pro4, Pro4-M, DGS, ITX) and one with A55 (DGS). Thankfully each are prefixed with FM2, meaning that differentiation with the FM1 boards is easy. The Extreme6 we are reviewing today is currently for sale for $100, right in the middle of the FM2 range on Newegg ($75-$140). This initially makes it more palatable when going for the high end Trinity processors (such as the A10-5800K used in this review). When reviewing a motherboard, one of the prime concerns is whether the product is ‘worth the money’. This can produce two conflicting arguments – are we technically looking for a board that is concise with no excess, or something that offers additional features for free? If it offers additional features, does that mean if we do not want them they will be taken off and we can get it for cheaper? Everyone likes to quote the typical ‘three year’ PC cycle where people upgrade on a regular basis, so at what level does a user want future proofing? Early adopters of USB 3.0 relied on controllers linked to old chipsets, whereas now we have them built into the chipset which reduces a layer of abstraction and latency. Technically every motherboard can be argued one way or another – if it is not value for money but has features that may not be used, they might be used in the future when technology becomes more mainstream. If we did not have future proofing, then it would take longer for such controller-based additions (Thunderbolt, USB 3.0, and SATA 6 Gbps) to be cheap enough for mainstream products. Because quite a lot of these extra features are now part of the chipset, a motherboard manufacturer can make a standard product with a lot of features without having to deal with bulk purchasing any major controllers. Concerns on modern motherboard inclusion are often in the power delivery, the fan controllers, PCIe switches, and the controllers for the network interface and audio. 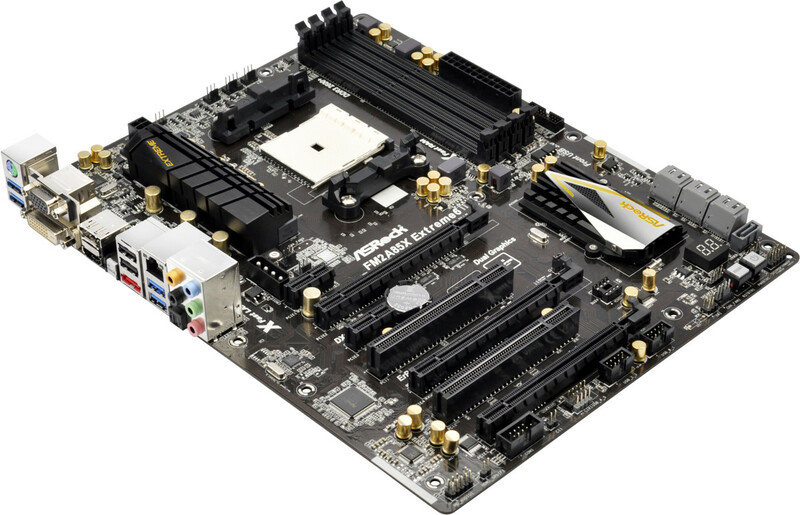 The ASRock FM2A85X Extreme6 takes this a stage further, offering an ASMedia ASM1042 for two extra USB 3.0 ports on the rear panel, as well as a two-digit debug LED with power/reset buttons. We get a very typical Realtek ALC898/8111E combination for the audio and network, as this combination is often sold to manufacturers at discount (and why Intel based NIC motherboards can be more expensive). Like most FM2 motherboards, the FM2A85X Extreme6 gives a full selection of video outputs – D-Sub, DVI-D, HDMI and DisplayPort. The motherboard claims support for up to DDR3-2600+ memory, and the eight SATA ports are split such that seven are available on the board, and one is an eSATA port on the rear IO. To add some cream on the top, we have access to six fan headers on board, though only two are 4-pin. One of the big features ASRock wants to promote is their X-Boost button. By pressing the X button on a USB keyboard at boot will cause the system to restart and apply a preset overclock to the system. This overclock is akin to the MultiCore Enhancement/Acceleration we see on some vendor Intel Z77 systems, whereby the processor is made to run at the maximum turbo bin no matter what the loading. As always with ASRock products we get access to XFast USB (better speeds under one USB port at a time), XFast LAN (cFos network management software) and XFast RAM (ability to partition memory as a fast cache). Performance wise, we have already covered high-end Trinity against dual core Ivy Bridge – our main points of comparison here are between our previously tested FM2 board from ASUS and this ASRock FM2A85X Extreme6. Both boards trade blows, with the ASRock coming out ahead on gaming tests but the ASUS performing well in single threaded scenarios. For $100, the FM2A85X Extreme6 hits a better price point in terms of price-performance against the ASUS, at the possible detriment of the underlying design of software. However, as a plug and play motherboard, it performs well. 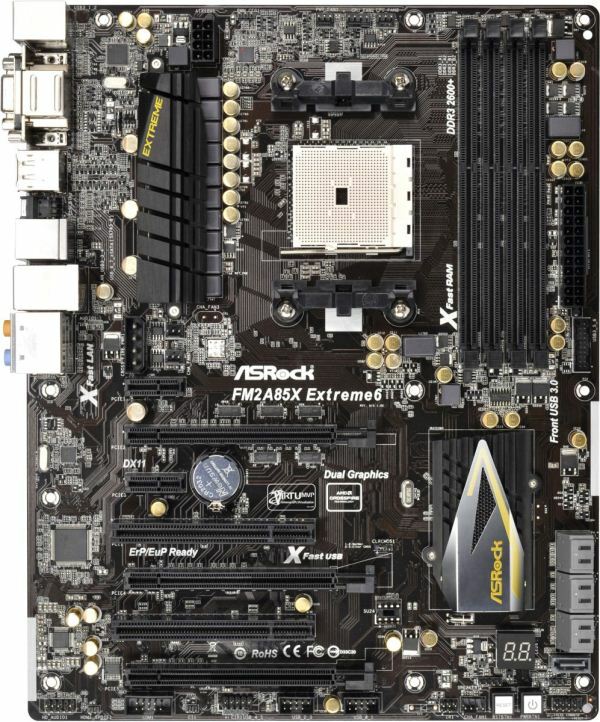 At first glance, two things started to irk me regarding the ASRock FM2A85X Extreme6. Firstly, the amount of components on the top left of the motherboard is insane. There are a lot of resistors and other components which just means that the board takes longer to produce, and statistically there is probably more chance of something going wrong (having fewer components seems to help overclocking as well). The second is the 4-pin molex connector in the middle of the board. If other motherboards with similar designs do not need it, then why is it here to supply power to the PCIe lanes? It is in the worst place possible – ideally we would have this at the bottom of the board at right angles, or preferably with a board with this layout, not at all. Other motherboards, if they need extra power, seem to use either SATA or 6-pin PCIe power connectors on the edge of the motherboard. Nevertheless, the socket area itself is very large and free of obstructions. The nearest edge to worry about with large coolers is the power delivery heatsink, which in this board is designed in black and gold with straight edges. The heatsink is a single unit and not connected to the chipset heatsink, but feels sufficient and up to the task. In terms of fan headers, the CPU socket has direct access to five – three above the socket (4-pin, 2x3-pin) and two below the power delivery heatsink (both 3-pin). The final fan header is located at the bottom of the board and is 4-pin. Along the right hand side of the motherboard we have the 24-pin ATX power connector, a USB 3.0 header (powered by the chipset) and seven SATA 6 Gbps in grey. Next to these is the chipset heatsink which again uses the black and gold color scheme with sharp edges as the power delivery heatsink. The power and reset button combination is on the bottom of the board, with the two-digit LED Debug just above. The bottom in comparison to other boards in the range is relatively bare – we have the aforementioned power/reset buttons, two USB 2.0 ports, a fan header, a front panel audio header, a COM port header, and the front panel header. The PCIe layout, like other FM2 boards, allows the use of two GPUs and a PCIe x1 device fairly easily. In comparison to other boards tough, ASRock switches out one of the PCIe x1 slots for a PCI, should any users have PCI sound cards or devices. From top to bottom we have a PCIe x1, x16 (x8 in dual mode), x1, PCI, x8, PCI, x4. This final x4 is powered through the chipset rather than the CPU, and is capable of being used in Crossfire (albeit with a small penalty due to routing through the chipset). Unlike some other boards, this ASRock FM2A85X Extreme6 uses slightly thinner IO designs in order to fit in a ClearCMOS button. The downside of this is that for the USB 3.0 slots on the left, any large and bulky USB devices may not fit properly if a DVI-D cable is being used at the same time. We have seen this before on other ASRock models. From left to right we have a combination PS/2 port, two USB 3.0, D-Sub, DVI-D, DisplayPort, HDMI, a ClearCMOS button, two USB 2.0, an eSATA 6 Gbps, a Realtek GbE NIC, two more USB 3.0, an optical SPDIF port and audio jacks. In an ideal world, I would have liked to have seen the DVI-D and D-Sub combined into a DVI-I and an appropriate connector included in the box. This would have allowed the IO panel to be more space optimized and extra USB ports added. Despite the combination of Realtek NIC and audio, we can take some solace in the fact that the Realtek ALC898 is being used rather than the ALC892 or ALC889. Using gold covered capacitors is more an aesthetic point than anything else, keeping in the black and gold theme. Despite the amount of resistors and visible tracings on board, I still can not get my head around the need for a four-pin molex, especially in the middle of the motherboard. It should also be noted that the BIOS chip is easier to remove on this motherboard than some of its competitors. This seems like an odd feature for a midrange board as opposed to one targeted at the sub-ambient cooling crowd.